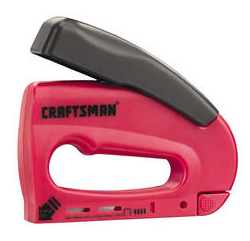 Craftsman Forward Action Light Duty Stapler Just $5.99! Down From $11.99! You are here: Home / Great Deals / Craftsman Forward Action Light Duty Stapler Just $5.99! Down From $11.99! Sears has this Craftsman Forward Action Light Duty Stapler on sale for $5.99 (Reg. $11.99)! This Craftsman forward action light duty stapler comes with a one-year general warranty and is part of the family of quality tools and accessories that carry the Craftsman name because it’s made to last. You don’t need brute strength to make this work because of its clever design that makes it a snap to fire. A window lets you see when staples are running low and when it’s time to reload.